Is it really that time already. These look fun pinning for later. omg, this is like Saltine Toffee on steroids! This is the best Halloween dessert I’ve seen in awhile. LOVE!! YUP…soon enough it will be that time of year. This looks great. The perfect Halloween party treat. My kids would go crazy for this! I love that you use Saltines for the base. So simple! Oh my goodness, you literally have me drooling. I’ve never tried a bark recipe using saltine crackers, though I have seen them on Pinterest. The salty/ sweet / chocolate combo sounds unbelievably good!! I am SO ready for Halloween everything! This bark looks so yummy! Thanks!! Yep – get ready for Halloween! I started to make them for my kids sporting events. From grammar school through college. I also added sprinkles on different occasions for a festive look. Now my daughter is making them for my grandsons activities. I make them as an individual cracker. I’m going to try it this way, as cracked bark. I know how hard it is to separate them once the Carmel gets hard. It separates easier with a silpat sheet or I also use parchment paper. I think it will come off that easier than the foil. Yes – this is a classic that I totally turned into my own! Thanks for the tip on using the silpat and/or parchment paper! I’ll incorporate that now into the post! Yummy!! I love this recipe!! The bark is fun and easier to break than the individual crackers! 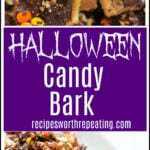 I’m bookmarking these yummy candy bark recipe! My kids would loooove it! Not just it looks delicious, but it’s perfect treat I’d love to make for Halloween! Thanks for sharing this recipe! I am also a sweet tooth, and that bark is just staring at me in the face. It’s tough to pinpoint my favourite type of candy growing up. However, I have a recent obsession with kinder buenos. Love those things. This is such a clever idea Amanda! I love Reese’s candy. I would love to make this for a Halloween treat for my kids. I would be addicted to this. What a great way to use up all that Halloween Candy the kids get! Going to have to save this one!